On Friday, our students participated in a very special Rosh Chodesh program that celebrated Gilad Shalit's safe return home. The program started off with an inspirational discussion with Rabbi N. Besser, Dean of Students, as well as a moving video portraying Gilad's journey home (below). The program was followed by the first Rosh Chodesh Kumzits and Rikkudim of the year. The Suzanne Blaine Dine and Discuss Program is fast approaching! 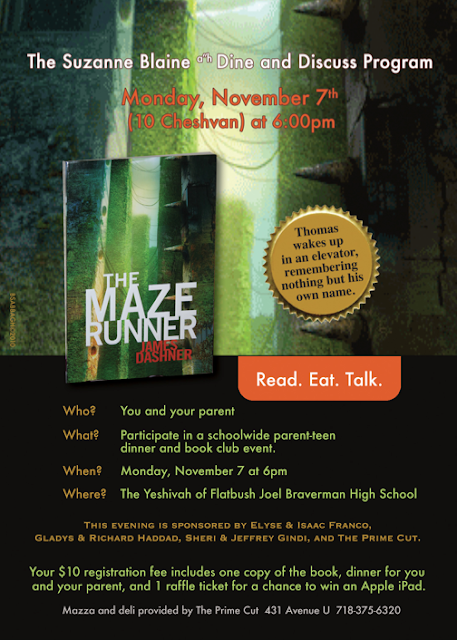 On Monday, November 7 at 6pm, registered parents will meet students in the gym for dinner followed by group discussions of The Maze Runner by James Dashner. We look forward to a fun evening filled with stimulating conversations. To make the evening enjoyable for all those attending please be sure to finish reading the book before Dine and Discuss. The second book in the trilogy, The Scorch Trials, will be available for purchase at the Dine and Discuss check-in desk. If a facilitator has not contacted you yet regarding your group placement please call 917-921-0898. The Suzanne Blaine Dine and Discuss Program is brought to you by the Yeshivah of Flatbush High School English Department and PTRE, Parents and Teens Read for Enjoyment. Dinner will be provided by The Prime Cut. Stay tuned for weekly Dvar Torah presentations from our wonderful students. The Torah To Go Series is brought to you by the Spiritual Growth Commission. Rabbi Benzion Klatzko spoke to the students of the Yeshivah of Flatbush recently, posing the question,what is Judaism? The first assumption that most of us made was Judaism is a religion; after all what else would it be? If Rabbi Klatzko would be asking about Christianity, Buddhism, Islam etc that answer would be correct. We learned that Judaism, however, is much more than a religion. Every aspect of Judaism and being Jewish encompasses the idea of building and maintaining our relationship with G-d. Every single Mitzvah, Halacha and Minhag that we follow is for the sole purpose of bringing ourselves closer to G-d and confessing our love to him. Shabbat for example is our "date with G-d." It is the one day that we set aside to show G-d we will stop everything, because we love Him and want to spend time with Him. All week we are too busy to even think about G-d. It is hard with all that we have going on in the week to continuously build on that relationship. That one day a week where we try to connect to G-d the most is Shabbat. We are actively proclaiming our love to Him, and in return G-d promises to take care of us and help us throughout that week. G-d also allows us to do this through his Torah. It allows us to have a constant and ultimate relationship of giving and receiving with Him. Rabbi Klatzko is the founder of Shabbat.com, a website which connects hundreds of Jews around the word for shabbat meals, shidduchim and more. As a hands-on and loveable ambassador for the Jewish faith, he reconnected literally thousands of young Jewish men and women to their heritage. He also made an impressive splash in the broader Jewish community, earning the moniker “The Hollywood Rabbi.” Some of Hollywood’s biggest stars and producers including cast and staff from Friends, Malcolm in the Middle, Third Rock From the Sun, and Directors and Vice Presidents of Sony, Disney, and Warner Brothers, became regulars at his popular monthly class on Jewish thought. Rabbi Klatzko and his family currently live in Monsey, New York, where hosting 50 or more people for Shabbos in the norm. All of us at the Yeshivah of Flatbush would like to wish you a Chag Sameach! The goal of the Spiritual Growth Commission (SGC) is to inspire students to strive for Torah growth in a meaningful and interactive way both in school and beyond. Students create original art to express Torah values, utilize technology to connect to mitzvot, and fortify individual character traits. On Wednesday, September 28th, before Rosh Hashanah, a group of students went to hear Rabbi Reuven Feinstein give a special shiur. Unfortunately, this is the case for hundreds of families in our community. At the Yeshivah of Flatbush High School, we realize the need to help and get involved. We are offering an opportunity to help in this great mitzvah! We have created a new commission to address this pressing issue in our community. This new commission, titled Helping the Hungry, will be managed by student commissioner Hiram Haddad. This commission will begin cooking for our community on Wednesdays after school from 4:00-5:15. You can learn to prepare a variety of entrees, dinners and desserts. All of the food prepared in this course will be sent to needy families who can then enjoy delicious homemade dinners. Cost: $10 weekly to cover cost of ingredients. Sign up for as many weeks as you prefer. Shifra Hanon, Tami Morano, Lesley Chera, Giselle Dayan, Amy Sasson, Claire Frasti, Paulette Dweck,Rosie Dayan, Lisa Klein, Norma Shamosh, Robin Dweck, Sara Harari, Rebecca Maleh, Linda Ebani, Ester Jerome.